A smartphone... for the elderly. Sounds silly, doesn't it? Well, the guys at Fujitsu do not seem to think so. In fact, that is exactly what the Japanese company is working on right now, according to Nikkei. 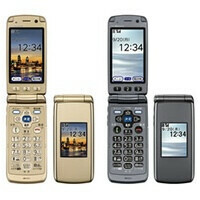 The smartphone in question will be a part of the popular Raku Raku phone lineup, which Fujitsu has been manufacturing since 1999 exclusively for Japanese carrier NTT DoCoMo. These are simple, easy-to-use devices with big buttons, shortcut keys for emergency services, and health diagnostics utilities. Now here comes the more interesting part: Fujitsu is planning on selling the Raku Raku smartphone outside of its homeland. After its Japanese debut, which is scheduled for some time during the first summer months, the device is expected to be made available in Europe and the U.S. That Fujitsu was planning on expanding its business overseas is something that we knew about already, but we were really hoping to see some of the company's high-end models, such as the Tegra 3 powered Fujitsu Arrows. Or in other words, Fujitsu may have chosen to enter the U.S. and European markets with the Raku Raku smartphone, instead of bringing its big guns to the table. At this time we have no idea what the Raku Raku smartphone will look like, but it is speculated that it will be a flip phone with a pretty decent main camera. Also, it will most likely be resistant to dust and water damage, just like many of the company's handsets. What Android version it will run is not exactly clear, but it is safe to say that its interface will undergo some serious simplification. Can they see the screen?